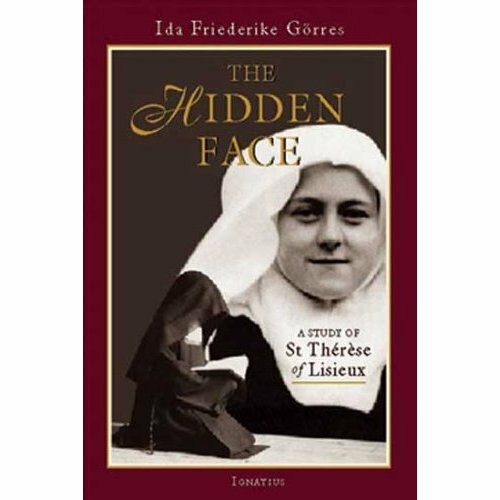 The Hidden Face by Ida Goerres ignited my lifelong interest in Therese. This study of the life and character of Therese of Lisieux is a remarkable, penetrating, and fascinating search for the truth behind one of the most astounding religious figures of modern times. A young nun who entered a convent at fifteen and died at twenty-four, Thérèse roused an incredible storm of spontaneous veneration only a few months after her death, and has been called by one Pope as “the greatest saint of the modern times.” Countless images of the sweetly smiling saint flooded the world. But who was she, really? The Hidden Face has sprung from this question. It presents the true Therese, as objectively as possible, and gives a convincing interpretation of her sainthood. It is a book not for Catholics alone, but for anyone fascinated by the force of spirituality, by the incalculable effects of what Pascal called the “greatness of the human soul.” It opens the cloistered world of the Carmel, takes off the sugar coating, and reveals the stark drama behind convent walls, the tension between personalities, the daily details of conventual life. And it throws light on the tremendous purifying process that turned the pampered darling into a saint of heroic virtue. The work of a mind of rare intelligence and integrity, this book is unique among the lives of saints. First published in Germany in 1944, the original is now in its eighth edition. This first English translation is based on a new, revised version using the latest edition of the saint's writings. Ida Friederike Goerres is the author of several outstanding works on sanctity including The Nature of Sanctity and The Cloister and the World. The Hidden Face is considered her most important work. $19.95. For details or to order, click on the image. For details or to order, click on the image. After Thérèse of Lisieux died on September 30, 1897, her popularity rapidly extended well beyond her homeland of France. Thérèse has been an inspiration to untold numbers of ordinary people to whom her life proclaimed in a compelling way this gospel truth: absolutely nothing can separate us from the love of God. Thérèse knew that God led her, with all her inadequacies, to holiness. She assures us that God can do the same for us. Selections from Thérèse's writings, with commentaries that root her wisdom in Scripture. A suggested prayer exercise in each chapter. Suitable for everyday prayer or retreat use. Paperback, 160 pages, $12.95. For details or to order, click on the image. To purchase this book, click on the image. "Prayer: Insights From Therese of Lisieux," by Christopher O'Donnell, O. Carm. Paperback. For details, click here. Thanks to Internet Archive, read Christopher O'Donnell's article "Therese: A Saint for Today"
"The Passion of Therese of Lisieux" by Guy Gaucher, OCD. with a new introduction by Fr. Benedict Groeschel, CFR. To purchase The Passion of Therese of Lisieux, click on the image. John and Therese: Flames of Love: The Influence of St. John of the Cross in the Life and Writings of St. Therese of Lisieux by Guy Gaucher, OCD, the foremost expert on Therese in France. 192 pages, paperback, $12.95. For details or to purchase, click on the order. To purchase Light in the Night: The Last Eighteen Months of Therese of Lisieux, click on the image. Read a review of The Way to Love: Therese of Lisieux published in Spiritual Life (Winter 2001). To purchase the book, click on the image.